WHY REMEMBERING HOLOCAUST VICTIMS ? 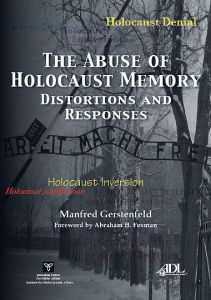 In his book 'The abuse of Holocaust memory' - Distortion and responses, 2009, Manfred Gerstenfeld writes about his research. As time passes Holocaust history lends itself more to manipulations, despite the increase in historical information. This process wil not stop, and this consideration has to be the starting point for the development of policies on how to preserve the memory of the Holocaust. Testimonies of witnesses have been a crucial element in building and maintaining a correct collective memory of the Shoah. Of those who consciously experienced Wordl War II, few still occupy positions of importance in society. The number of surviving witnesses of the horrors of the Holocaust is rapidly declining. This is happening in a societal environment where the overall uncertainty about the future is growing and moral relativism is rife. Ant-Semitism frequently increases in such a situation. Thus the struggle for maintaining the memory of the Holocaust, as well as the fight against its distortions, is likely to become more difficult, as the last survivors and other eyewitnesses pass away. One will increasingly have to explain the reasans for keeping the memory of the Holocaust alive and why this is important not only for the Jews but also for society at large. (--) One major reason for maintaining the memory of the Holocaust is a moral obligation toward those who perished. Forgetting them also means the fading away of the crimes commited, thus facilitating their return in various forms in contemporary society. There is a second moral obligation – the one toward those who survived and suffered the consequences of their Holocaust experience for the rest of their lives. (--) A further reason for fostering commemoration of the Holocaust is that in those countries where Jews were persecuted and parished their story should be part of the collective memory and national history. There are many who would like to erase the crimes of their forfathers. More likely, the less these crimes are confronted the easier it will be for similar criminality to develop in the future. In the battle against the distortion of Holocaust memory, maintaining the truth about what happened is essential. The remembrance of the Holocaust is also important for society at large. Almost sixty-five years (the book is from 2009 - kvw) after the war, many have learned few lessons from history and are inclined to repeat, in today’s changed environment, the mistakes of the past. Maintaining Holocaust memory is a tool that can perhaps to some extent prevent this. In postmodern society, distortion has fragmented and will proliferate further. Thus the battle against distortion must be fought on a great many fronts. It cannot be seen as incidental or occurring in isolation. It is one major issue in the framework of the correct memory of the Shoah. So far a brief text from the book of Manfred Gerstenfeld.